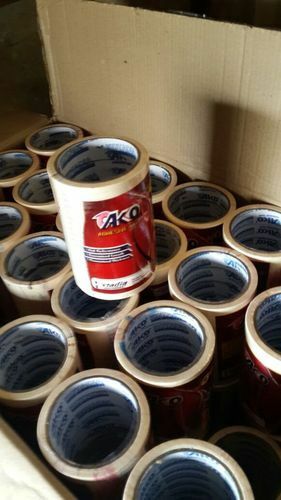 Our clients are provided with the best AKO Masking Tape which are made of natural crepe paper masking tape and are well coated with solvent rubber adhesive. These are widely used in various indoor applications and are highly flexible. Our products are best in quality and can easily bear high temperature. These tapes are easy to apply and can be cleanly removed. Incorporated in the year 1985, Kotadia Engineers is a highly acknowledged firm engaged in Trading, Manufacturing, Exporting, Supplying and Importing the best variety of adhesive products including Acrylic Foam Tapes, Curtain Wall Tapes, Structural Glazing Tapes, Transparent Tape, Foam Tapes, Masking Tape, Spacer Tapes, Masking Tape Jumbo Roll, Double Sided Foam Tape Jumbo Rolls, Double Side Foam Tapes, etc. We execute our business from economically active city Mumbai and Indore. Our decades of experiences and best facilities make easy for us to meet visiting customers and arrange good dispatch. We hold strong business network and supply our products to various automobile firms, leather industries, plastics factories and numerous other commercial sectors.